Manchester City striker Sergio Aguero was substituted as a "precaution" on Saturday and is not injured, according to manager Manuel Pellegrini. Aguero, recently out for six weeks with a hamstring injury, seemed to turn his ankle before being taken off after 63 minutes of a 3-1 win over Southampton. 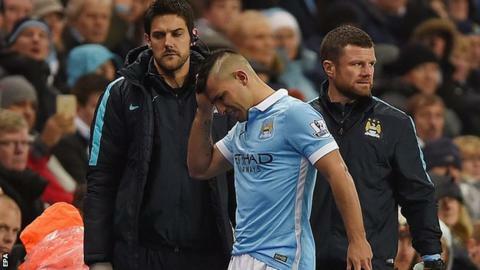 Pellegrini said: "I spoke with Aguero before the game and we said he would play 65 minutes. "He has a kick on his heel, but nothing important." Aguero was grimacing as he walked down the tunnel but Pellegrini added: "He has played three games in a row and that's why he came off. "It's important to see with the medical staff how he recovers from this game. It's hopefully nothing serious." The 27 year old injured his hamstring while playing for Argentina against Ecuador last month and has only played three matches since then. Wilfried Bony and 19-year-old Kelechi Iheanacho - who have scored only three league goals between them this season - are the only other out-and-out strikers in Manchester City's squad. However, Raheem Sterling and Kevin De Bruyne have each scored four goals this season from midfield.